It was founded in 1499, and was used as lodgings for the pilgrims who had ended their long journey along the Way of Saint James and finally reached their destination. 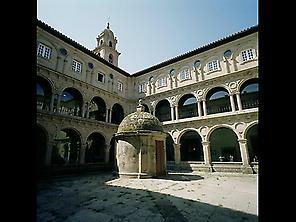 This beautiful Gothic building has today been converted into a Parador hotel. One of the highlights is the lovely Plateresque façade decorated with grilles which dates from the 16th century. Either side of the doorway there are two medallions bearing likenesses of the Catholic Monarchs. It has four interior courtyards. One of its most outstanding features is the lovely chapel of Enrique de Egas. Setting: The monument is located in the centre of the city of Santiago de Compostela, one of the most important monument complexes in Spain. The interior courtyards and the chapel are open to visitors.